Adam Share is taking on the Donna Louise Tower-to-Tower 2018 Challenge! This is a new route, never before attempted, which is more demanding and exhausting than any of the challenges that have gone before. We will be travelling a staggering 560km, over 4 days and nights. The first part of the route is a 270km cycle from the Eiffel Tower to Le Havre. Once we reach Brighton, it’s a 100km trek to the finish at Tower Bridge. This mammoth journey will be exhausting, physically and mentally, and will push us to our limits. We will be experiencing the effects of sleep deprivation, whilst pushing our aching bodies beyond anything we’ve done before. The Tower-to-Tower challenge aims to raise awareness of the daily exhaustion of the families who are looking after children and young adults with serious, life-limiting conditions. Every single day they are experiencing sleep deprivation from providing round-the-clock care, making it hard to function physically, emotionally, and psychologically. The Donna Louise provide an incredible service for young people and children across Staffordshire and Cheshire, and support for their families. The money raised will help them continue to provide this vital service and expand their facilities. I am a firm supporter of the Donna Louise and I hope this challenge will encourage people to dig deep and show their support. We’re aiming to raise over £100,000 for this amazing charity – they are extending their facilities to accommodate young adults after they turn 18 years old, meaning they need to raise more money than ever to fund these and their existing services. Only 5 for months until I’ll be packing up and heading out to France for the start of the Tower to Tower event. My donation total is just over £1,500 – a big thank you to everyone who has supported me, and the Donna Louise, so far. The goal is to raise £300,000 from the whole challenge. The money will really help the Donna Louise to keep providing their incredible facilities to families across Staffordshire and Cheshire. 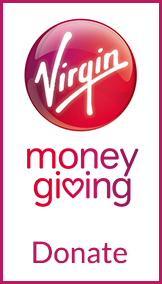 But this challenge is not just about the money… it’s also about raising awareness of the exhaustion families of children and young people with life limiting conditions experience on a daily basis. On our 4 day journey from the Eiffel Tower to Tower Bridge, we will experience sleep deprivation which will impair our ability physically and mentally. This is something these families experience every single day. If you can, please help support the Donna Louise by donating or just finding out more about the work they do and how you can help. 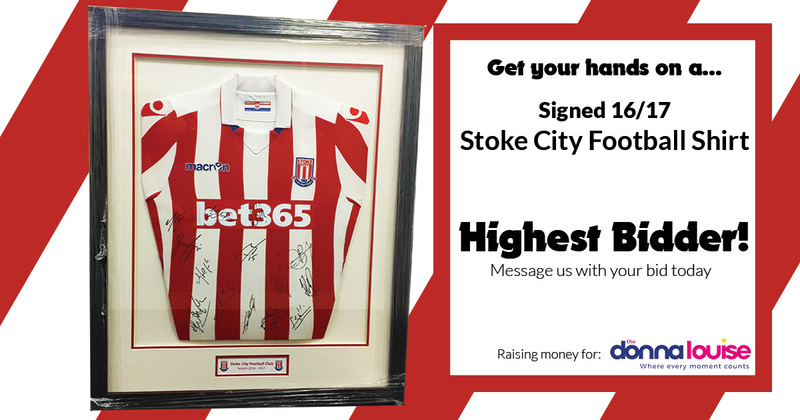 I’m auctioning off a SIGNED Stoke City Football Shirt to help raise money. This framed shirt will go to the highest bidder… we’re already at £75 and I’m hoping for more. The money raised from the auction will go to the Donna Louise. It’s a great opportunity to get your hands on this fantastic piece of memorabilia AND help support the fantastic work the Donna Louise do. It’s official… I am one of the 12 challengers taking part in the Donna Louise Tower-to-Tower challenge! Training has started already. The Tower-to-Tower challenge will be physically demanding, but I think the hardest part will be the exhaustion. Rowing the English Channel is a feat in itself. Rowing the English Channel after having cycled 150 miles, with no sleep, and then following it with a 60 mile run is a whole other matter! What motivated you to do this challenge? 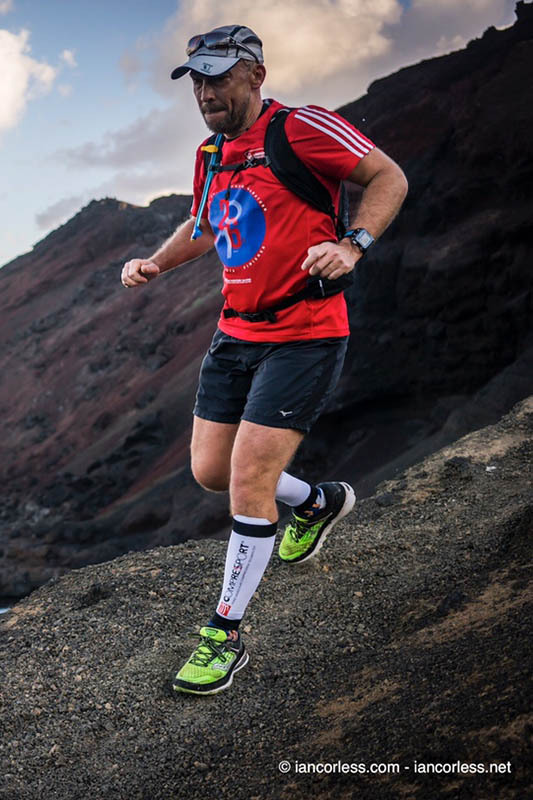 I had planned to do the Marathon des Sables in 2017, but unfortunately I had to pull out due to injury. I can cycle with no problems, but running is still painful. I wanted to continue to raise money for the Donna Louise and was looking for challenges I could take on. So when the Donna Louise approached me about the Tower-to-Tower challenge, I couldn’t say no! As a company, Red Industries have sponsored the challenge before. Now it’s time to go one step further and actually take part! The challenge has been designed to be exhausting, and I have no doubt we will all have dark moments. I think the hardest leg for me will be rowing across the English Channel. I’ve not done a great deal of rowing before, so this will be new to me – I’ve already started to do some indoor rowing to prepare, but it’s challenging! Once it’s just the 12 of us out on that boat, we’re going to need to keep positive and support each other to get us through. What will be your driving force when you’re out there? The Tower-to-Tower challenge is to raise awareness of the exhaustion that carers and families face every day. The Tower-to-Tower challenge is going to be incredibly difficult, but it’s nothing compared to what these families face day-in, day-out. The Donna Louise has incredible plans for the future, every penny raised will help them continue to deliver this vital service and expand their facilities to help even more people. Please donate to this fantastic charity. All the money raised is being donated to the Donna Louise charity. Find out how your donation helps. The Donna Louise is a registered charity caring for children and young adults with life-limiting conditions, and their families, across Staffordshire and Cheshire. The Donna Louise is there day and night to support, help, and provide whatever is needed. Their purpose built center is the light in the darkness – they provide fun, laughter, support, and respite. The Donna Louise is a fantastic charity offering support to children and families going through the most difficult times.